Does a country’s growth rate or foreign investment impact its stock markets? To be successful, investors should be able to comprehend events that trigger the stock markets upwards or downwards. The simple answer to this question is that the flow of money in and out of markets causes the latter to fluctuate. A lot of people have a lot of question about the movements in the stock markets - what is it exactly that causes the stock markets to move up and down? This is a question that a lot of people should ask before embarking on their investment journey. But, they don’t. As a result, stock market movements give you headaches. This concept is something that doesn’t really concern investors in debt instruments, commodities, real estate, etc. Debt instruments are more or less stable depending on the credit rating of the said instrument. What about stock markets, though? Movements in the stock market are a direct result of fluctuations in demand and supply. While the general rule of demand & supply obviously works in the case of individual stocks (or anything, really), demand & supply play a major role in stock market movements as well. This brings us to the concept of bull and bear markets. In a bearish market, the market doesn’t move because of stagnated/declining demand. On the other hand, a bullish market sees lots of demand and therefore calls for broad movements in the stock market. Investors are always on the lookout for the next big thing. If investors notice that a certain company or a certain market is performing well, they probably won’t miss the ride. Investors are always looking for the next Alibaba -- something that will skyrocket their wealth and give them maximum returns on investment. Do you catch the drift? Money flows where there is scope to make more money, and flows out of markets where growth has stagnated or is in decline. As an investor, you should always keep an eye out for foreign fund inflows into markets - it is always a telltale sign of healthy markets. The overall growth of an economy brings growth to domestic companies too. This, in turn, sets the wheels in motion for upward movement in stock markets. 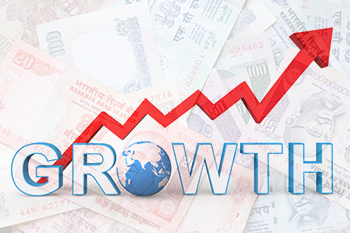 Growth rate continues to play a major role in market movement among other important factors. With economic growth, one also sees an increase in overall investor expectations. This results in greater inflows and therefore, a higher stock market movement. Investors outside India continue to pump money into its markets. Foreign Direct Investment (FDI) and venture capital (VC) investments put in 60% of the total foreign investment. We’ve already discussed how money moves from stagnant markets to those with potential for growth. A similar logic can be applied to foreign investment. An increase in foreign investment in a country’s stock markets indicates an upward trend in the markets. Declining foreign investment can show signs of stress in the market. Tracking foreign investors can help you decide when to invest. Stock markets are influenced by a number of factors and are in a constant state of flux. In the long term, these fluctuations are averaged out to indicate upward or downward movements. A number of factors, including governmental policies, directly impact the stock market. A growing economy grows along with its businesses. In the long term, economic growth directly impacts stock market movements. The magnitude of inflow of foreign capital also impacts stock markets. More money flowing in shows signs of positivity, while declining investment could be seen as signs of trouble.